1- What represents for you to receive La Màquina del Temps award? I think it’s the culmination of the varied movies I have taken up in my career. I’ve always been a little edgy, a little out there and a little fantastic. 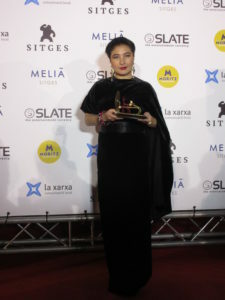 It was such an honour to receive The Time Machine Award at Sitges. I’ve had the opportunity to receive “The Best Actress Award” from my film that I had produced called Dream Home. I’m very pleased to be invited and so surprised to receive this Time Machine Award. I was so touched!!!! 2- You have been a jury member in Sitges Film Festival 2018, I guess, is not easy to answer but which movie has caught your attention? Haha…..that is such a trick question. Every film has made me learn tons and tons of film knowledge. I guess “Aterrados ” was very scary and “The Mermaid”. Climax just shock the hell of out of me, it was a masterpiece. But there were too many excellent film that I can’t say it all here. You should watch all of them too! 3- You have been years before in this festival .What do you thing about this Sitges 2018? Honestly, it was my first time really getting to go to Sitges this year, I really love the atmosphere there. I feel the fans fervor. The effort of the whole festival was 24/7 nonstop. I’m so impressed and motivated by it. It makes me want to make a film now! 4 – and, what is your opinion about the winning films Climax and Lazzaro Feliz ? Climax, in my opinion is a total hands down! Unconventional and brilliantly shocking just like Gasper Noe. Lazzaro Felice is a moving piece that shows me humanity. I learned so much about the tobacco farmer’s situation in Europe. It’s a humanity epic piece. 5- The honkones cinema has grown a lot, how do you see it and, if there are some lacks? 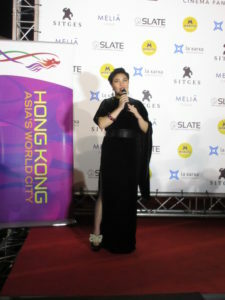 I think Hong Kong is booming with master class directors and they are also nurturing a lot of wonderful new directors like Johnny To’s organization New Wave competition which is the best place to find good new directors. 6- How do you see the new promises of the honkones and Hollywood cinema? I think with a Fantastic theme it will always be promising. Audiences love to be shocked and surprised. Well, that’s what I thought too. 7- Would you like to work in a Spanish movie? 7- Can you tell me , some director’s name that you can highlight? Well, I’ve worked with Gonzalo López-Gallego in” Open Grave”. It’s was very sensuous. If I have to name who I would die to work with, I think you know the names already. Pedro Almodóvar, Guillermo del Toro…. 8- You played in Lucky Days. Roger Avary wanted to have in the movie the characters´s spirit of ” True Romance” and ” Pulp fiction” . Do you thing that he achieved? I think that we have a wonderful and friendly cast, I’m sure he achieved it. I did a small and interesting cameo. All I can say is that I did something that I had never done before. So hopefully, it’s surprising for you. 9- How was working with the cast of characters and with Mister Roger Avary? I remember interviewing him in the Sitges Film Festival … that was a long time ago . He is a very nice and funny gentelman. It’s was hilarious! I can’t wait for the film to come out. Everyone was having so much fun on the set. I couldn’t believe Roger almost conned my assistant into playing a role. 10- When you were a little girl, did you like the horror movies ? I love horror, but I am one of those who used my backpack to cover my eyes as I peeked. 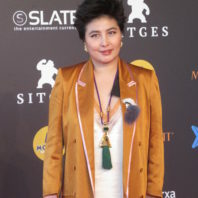 Many thanks Mrs Ho for the interview and , hope we will meet again , maybe in Sitges Film Festival 2019 ….